My name is Weliton Tavares, I am from Caldas Novas - GO, in Brazil. I have got a degree in Languages and I have been teaching English since then. So whenever I am in a classroom teaching English I feel like doing my own thing. I am also a music lover and I am here to learn from your incredible experiences and to share interesting resources. This is one of Mr. Sheeran´s latest songs and it is definitely one of the most beautiful too. My students´ hearts melted and they simply loved this activity. I hope yours will do too. ATTENTION! In order to make the file fit in the 1MB size, I had to convert it into an image and then insert it in a new Word Doc. Hello everybody! When it comes to songs, we need to mention ADELE. 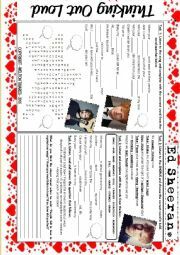 So I prepared one of her greatest hits: "Rolling in the Deep". I hope you might have fun with it! Hi there friends! 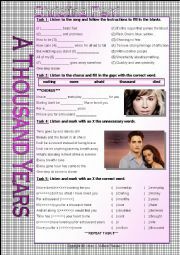 Well, to celebrate my return I prepared this song worksheet with one of the most amazing songs I´ve ever heard. The Twilight Saga lovers will like it, ´cause it´s the Breaking Down Part 1 movie theme. I honestly hope you like it! Best wishes!!! 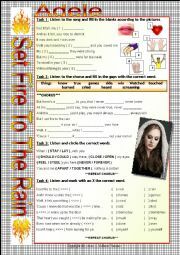 This worksheet provides 04 different activities with the famous song "Love the way you lie", sung by Eminem and Rihanna. 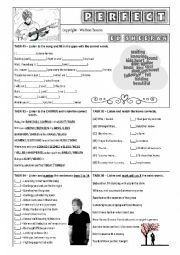 My students loved this worksheet and I hope your students enjoy it too. If it´s possible, show the video and discuss about domestic violence. Big Hug!! Hi there friends! It´s been a while since I last posted something here. My students asked me to prepare this song, and so I did. I hope you like it! =) Merry Christmas to everyone! Hi there, friends! 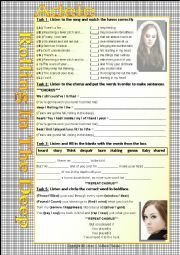 To celebrate the back-to-school week, I´ve prepared this song worksheet with the latest Adele´s hit: Hello! I hope you like it! Big Hug!